Let us examine the character of each of these three prayers in turn. For illustration, I will refer to prayers from this past Sunday (the Thirteenth Sunday in Ordinary Time). The opening prayer is called the “collect” because it is occurs when the congregation has been gathered together, or “collected”, to worship. 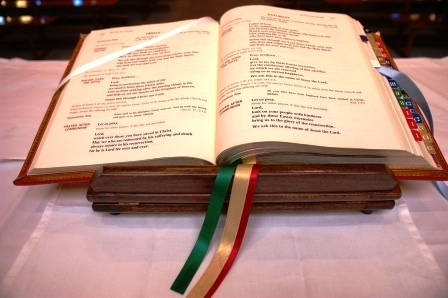 The General Instruction of the Roman Missal (GIRM) prescribes a brief silence before the prayer is said: thus, when the priest says, “Let us pray,” he is not merely referring to the spoken prayer itself, but inviting everyone to “call to mind their intentions” (GIRM, §54) and to become disposed for the mass. There is a clear theme in the prayer: the call to live fully our vocation as “children of light”. The latter phrase is taken from 1 Thess. 5:5 and the petition “to be seen to stand in the bright light of truth” is probably alluding to Matt. 5:16. The symbols of light and darkness are particularly rich in our Christian tradition, and this prayer calls us to reflect on certain aspects of light and darkness, truth and error. We are reminded that God, who is light (1 Jn. 1:5), has adopted us as his own children (Jn. 1:12, Rom. 8:15, Gal. 4:4–7, etc.) We do not, then, generate our own light, but rather stand in God’s light. In fact, as the prayer says, the only way to escape the light is to “be wrapped in the darkness of error”. This striking metaphor conveys the message that God is everywhere, and it is only by creating a layer of darkness around ourselves that we can create the illusion that we do not exist by the grace of God’s light. Further, we are reminded that truth pre-exists and transcends us. We “stand in the bright light of truth”: the truth surrounds us and precedes us. Looking to our own resources to generate our own “truths”, then, is foolish, and we will only end up in the “darkness of error”. As the foregoing commentary illustrates, there is a lot to reflect upon in this prayer, and I have only briefly mentioned the points that happened to strike me first. This richness is not unique to the particular prayer cited above: in general the collects are brimming with content. As the GIRM explains, the collect is intended to give “expression” to the “character of the celebration” (§54). Doubtless, each individual will only be able to focus on one or two of the aspects of the prayer as it is being spoken, but there is certainly enough material for everyone to find something to latch onto. And, as I shall suggest below, there is no reason not to meditate on the prayer outside of mass. O God, who graciously accomplish the effects of your mysteries, grant, we pray, that the deeds by which we serve you may be worthy of these sacred gifts. Through Christ our Lord. First, we are reminded that the sacramental mysteries have real effects. The Sacrament of the Eucharist is not merely a sign, but a very real way in which God accomplishes his salvific work in us. Second, we ask God to sanctify our good works in a way that makes them worthy of being joined to the sacrifice we celebrate. This recalls that our works are sanctified through God’s grace (c.f., Gal. 2:20). The above text is quite typical. In general, the prayer over the offerings asks God to unite us to the sacrifice of the altar. It is a good point during the mass to remember that we are called as Christians to offer ourselves as “living sacrifices” to God (Rom. 12:1). During the prayer over the offerings, we can offer God all of joys and all our sufferings, and we can also remember to him our intentions for the mass. May this divine sacrifice we have offered and received fill us with life, O Lord, we pray, so that, bound to you in lasting charity, we may bear fruit that lasts for ever. Through Christ our Lord. Notice that the sacrifice has been both “offered and received”. The mass is a holy exchange between God and man, and I am reminded of how C. S. Lewis once remarked that love can “obliterate the distinction between giving and receiving”. Hence, at mass we present our offering to God only to be “filled with life” in return. The sacrifice has “bound” us to God: perhaps this is intended to be a nuptial image by which we are reminded that the Church is the Bride of Christ. At the end of the prayer, we ask that the union which has been effected by the mass will “bear fruit that lasts for ever”. That is, as the mass coming to an end, we recall that we are being sent to proclaim the Gospel and allow the grace we have received to be efficacious in the rest of our lives into eternity. Again, this text is typical. Fortuitously, it happens to use the metaphor of fruit that is also mentioned by the GIRM, which explains that in this prayer, the priest “prays for the fruits of the mystery just celebrated” (§89). I hope I have conveyed that there are many riches to be found in these small prayers that change from mass to mass. It is easy for us to tune out when the priest says them, and while part of this is simply human nature, being attentive to the prayers of the mass is one way to respond to the Church’s invitation to a fuller participation in her liturgies. Let me close, then, with three practical suggestions for praying these prayers. Be intentional during mass. Obviously, the most important way to pray the prayers of the mass is to pray them! We should remember that the words the priest is speaking during the collect, the prayer over the gifts and the prayer after communion are not a private conversation between him and God. Each time, we are explicitly called to participate in the prayers when the priest says, “Let us pray.” To what extent are we ready to join in? Have we done our best to arrive at church ready to pray? Have we brought intentions that we are praying for? Pray the collect in private. While the communion prayers make little sense outside the context of the Liturgy of the Eucharist, the collect is more general in scope. In fact, it is used as the closing prayer for several of the Hours in The Divine Office. But in addition to praying the Divince office, another way to make use of a collect outside mass is simply to meditate on the points it contains during individual prayer. Furthermore, praying with it before mass can be an excellent way to prepare for mass—just as reading the daily scripture readings beforehand can also be helpful. For priests. It is very helpful to observe the rubric that calls for silence after the invitation, “Let us pray,” because it gives the congregation a moment to collect itself (pun intended) and be more attentive. As for the actual recitation: The new translation is Latinate in its construction, and thus the meaning of the prayer builds up in layers. Some priests try to make sense to themselves of what the prayer is saying as they are reading and easily get confused and stumble. An obvious solution is to take the time to look at the prayers before the mass and perhaps even practise how you will recite them. If you yourself are praying the prayers, and not just reading them, the congregation will feel more invited to join in. All actions that are preceded by prayer for spiritual benefit are performed with spiritual emotion; hence fewer errors are committed.